Does anyone else struggle with razor burn and shaving nicks the way that I do? I have been shaving my legs since I started swimming when I was ten years old and it feels like an issue I've had my entire life with a variety of razors, shaving creams, and body washes. The brand Remay recently contacted me and asked if I wanted to try out their Shave Gel Bar* and I figured, why not? 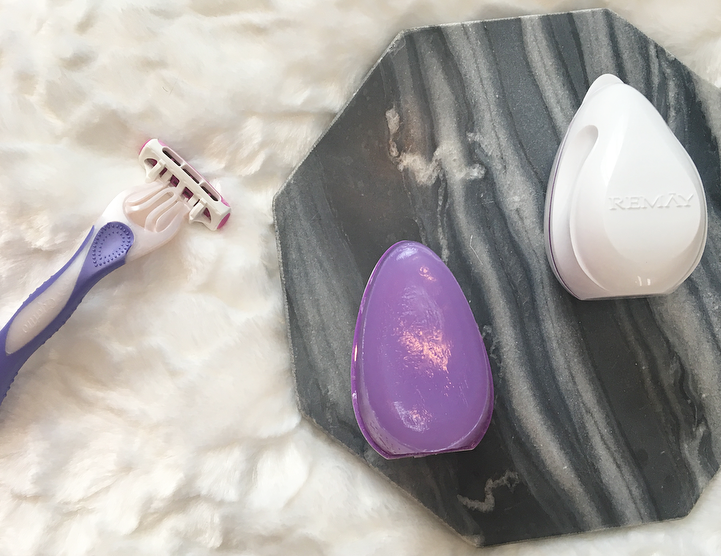 If, like me, you have never heard of a gel bar for shaving, let me introduce you to the concept: it's a solid shaving balm with a plastic handhold that glides across the skin and claims to be more protective, quick, and less messy than a traditional shaving cream or gel. You can see why I was so curious to try it out! As always, this is my true opinion. This is not a sponsored post, but I did receive this product in PR in exchange for an honest review! I have been using it for about two weeks, and I've been shaving my legs more often in those two weeks than I have in several months! 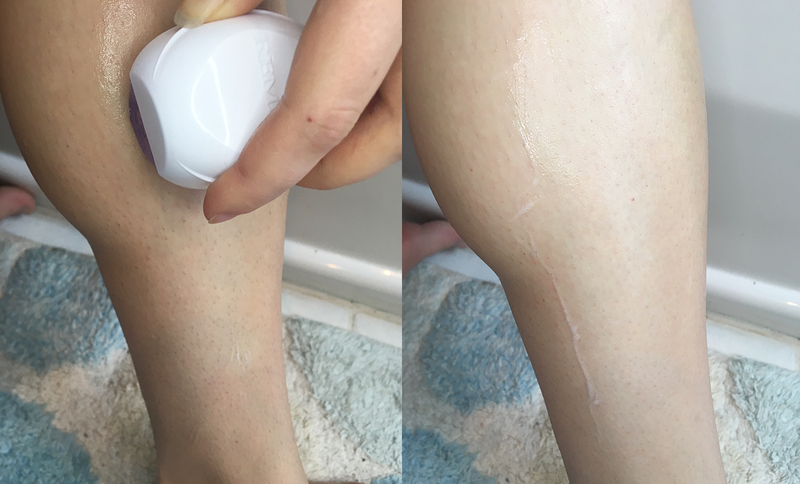 No one sees my legs in the winter, so I usually don't bother with shaving, but of course to test out a shaving product I wanted to use it often. So how does the Shave Gel Bar work? You simply wet your legs and then glide it across your skin and shave like usual. The texture of it is strange; it's not sticky or soap-y, oily or waxy. It's smooth but it doesn't feel heavy. It kind of feels like a very light lip balm. It leaves a subtle lather when it interacts with water. It doesn't have a noticeable scent and I like the packaging. It's user-friendly and great for traveling, I will be taking it to Mexico with me next month. 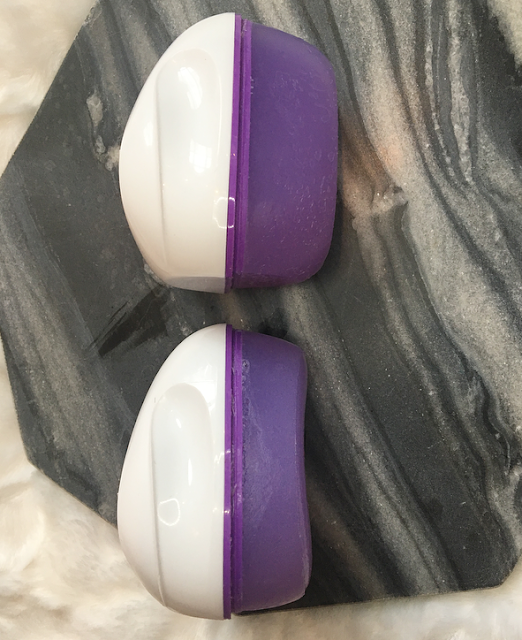 It comes in a plastic case and all you have to do is take off the lid and the balm is exposed, ready for use. It doesn't melt in the shower and I can imagine it would last for around 30 uses! I have used it 6 times and there is a small dent in the product. Above you can see it in comparison to the brand-new bar that I haven't used yet. Does this product really reduce nicks, bumps, and razor burn? For me, yes. It absolutely reduced them, though they didn't completely go away. Two weeks ago I had razor burn so badly that it stung to put on sweatpants! I wish I had taken a before photo, it was just awful. I was worried that more shaving would just irritate it more, but I haven't had razor burn since I started shaving with this product. I've had a few nicks, but less than usual, and most of them seem to be in the same places each time so I'm guessing my razor just reopened the cuts each time I shaved. As for its use in the bikini line, I haven't tested it, but I do like it for the legs and underarms! I also like that there is no mess involved with this product. I always seem to miss a patch or two when I use a shaving cream because it covers the leg hairs when I use it, but this goes on completely clear. I don't think that it saves a massive amount of time in the shower, but even if it saves a minute each shave that can add up quickly. The above photo is me applying the product (left) and after I shaved a patch (right). I didn't have a lot of stubble to begin with because I just shaved on Sunday, but I figured I would show the product in use anyway! I used a Schick Quattro razor that has four blades. On a side note, I never realized my calves were so big? Since when? Anyway, the only claim of this Shave Gel Bar that I don't agree with is it's 2-in-1 status. I have dry skin, especially in the winter, and I don't find the shaving bar to be moisturizing enough for me. It is no more drying than a usual soap or shaving cream is, so I still like to apply an in-shower moisturizer or a lotion after my shave. Every other aspect of it, though, I do enjoy. I can imagine myself repurchasing a double pack when my current two run out. The Remay Shave Gel Bars come in packs of 2 and 4. If you shave twice a week, you can use one bar for about 3-4 months which I think is a good deal. Overall, I think that this is an innovative product and I'm really happy that I got to try it out, especially because swimsuit season is coming up! I was offered a 20% code for my readers on the Remay website, which is Katie20! This is a code that I can make commission off of, so if you want to use it you are welcome to, but of course you don't have to. What do you think of this product? Have you heard of it before? 11 comments on "A New Way to Shave"
I'd never heard of these gel bars but they sound pretty cool! this sounds so interesting and I've never heard/seen anything like it before!